For thirty-something blogger Cora Chevalier, small-town Indigo Gap, North Carolina, seems like the perfect place to reinvent her life. Shedding a stressful past as a counselor for a womenâ€™s shelter, Cora is pouring all her talentsâ€”and most of her savingsâ€”into a craft retreat business, with help from close pal and resident potter Jane Starr. Between transforming her Victorian estate into a crafterâ€™s paradise and babysitting Janeâ€™s daughter, the new entrepreneur has no time for distractions. Especially rumors about the murder of a local school librarian . . . But when Janeâ€™s fingerprints match those found at the grisly crime scene, Cora not only worries about her friend, but her own reputation. With angry townsfolk eager for justice and both Janeâ€™s innocence and the retreat at risk, she must rely on her creative chops to unlace the truth behind the beloved librarianâ€™s disturbing demise. 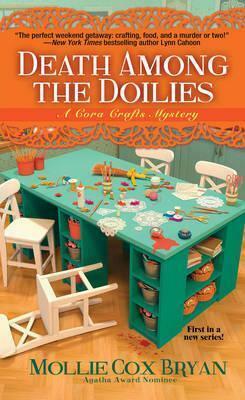 Because if the killerâ€™s patterns arenâ€™t pinned, Coraâ€™s handiwork could end up in stitches . . .